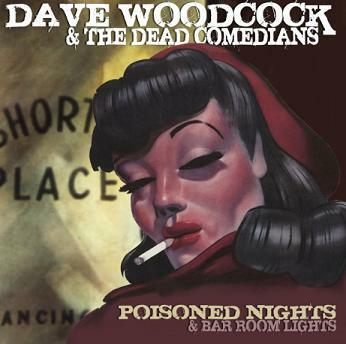 Poisoned Nights & Bar Room Lights is the second studio album from Sheffield band Dave Woodcock & The Dead Comedians. Following on from 2009’s acclaimed Omaha High Low, Dave Woodcock has arrived at a settled line up for his band of Dead Comedians, through almost two years of live shows promoting that debut record and honing many of the songs that appear here. It’s a tin that promises heartfelt, booze soaked, rock ‘n’ roll. And it delivers exactly that. Whilst Woodcock himself shies away from the term ‘Americana’, the influences are worn on the sleeve. There are echoes of the blue-collar anthems of Springsteen and the lyrical wordplay of The Hold Steady. Some of the laid back bluesier moments also brought Chuck Prophet to mind whilst the sometime venomous spitting out of lyrics recall Woodcock’s own Taste Of Shotgun past. There’s a nice variety and changes of pace to the record. Woodcock’s trademark growl is much in evidence, though perhaps feeling a little forced at times, the subtleties of his voice shining through better on tracks like ‘The Dregs (You & Me)‘ and perfectly positioned album closer ‘The Way Back Down‘. The album bursts into life with the foot stomping opener ‘Coming Apart At Every Seem‘, setting the tone for many of the themes to follow. The pounding drums and almost Tex-Mex flavoured guitar lines of ‘Julia See‘ underline more love gone wrong – “she’s my jukebox girl, but the money ran out, in the end her songs weren’t worth shouting about“. ‘Do I Laugh Now, Or Wait Til It Gets Funny?‘ sees elements of reggae incorporated into its sound before things slow down further with the ballad ‘Scarecrow Blues‘, continuing another theme of Woodcock drawing influence from his passion for films. ‘Sober On St. Patrick’s‘ crashes open with a flurry of lines that could have come from the mouth of Craig Finn. More alt-country rock rhythms are evident in semi-title track ‘Poisoned Nights‘, its other half ‘Bar Room Lights‘ a reflective laid back lament to another lost love, and one of the album’s stand out tracks. The twelve tracks of Poisoned Nights & Bar Room Lights represent a band at the top of their game. A record beaten into shape on the stage, and capturing the essence of those live shows for many more listens to come. Poisoned Nights & Bar Room Lights is released on Shotgun Records on September 12th.